My wife Pam and I are both graduates of Auburn University (from the era when Heisman Trophy winner Bo Jackson was our star football player; Pam even had a class with Bo back then). 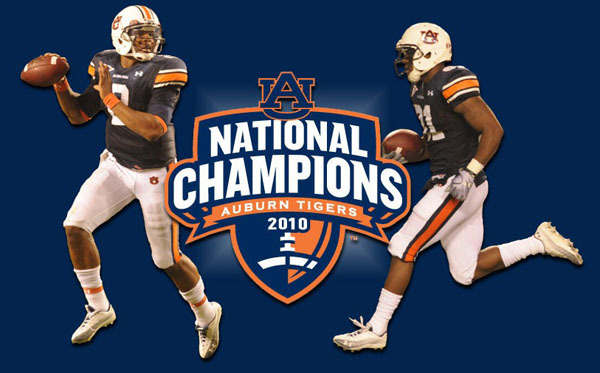 So last night’s victory in the College Football National Championship game was oh so sweet for me, especially after a couple of years ago, when Auburn missed the opportunity to play for the championship due to the screwy way the bowl system is set up. The Auburn Tigers finished a perfect, undefeated season, 12-0, by overcoming a tough Oregon team to win 22-19 with a last second field goal. It was worth staying up past midnight to see. In typical Auburn fashion, they kept me tuned in and on the edge of my seat till the final ticks of the game clock. If you got to Auburn’s website this morning, you can see a live webcam view of Toomer’s Corner, the traditional spot where students converge after a football victory, and toilet paper the intersection. Looking at the amount of TP there this morning, I think I should’ve bought stock in Charmin yesterday. So hats (helmets?) off to the Tigers on a job really well done. And if you’re wondering why the Tigers’ battle cry is “War EAGLE”… well, it’s a Auburn thing. You just have to go there to understand. This entry was posted in TNT on 11 January 2011 by Mr. Morrow.